For other uses, see Mozambique (disambiguation). Makhuwa, Tsonga, Lomwe, Sena and others. Mozambique (/moʊzæmˈbiːk/), officially the Republic of Mozambique (Portuguese: Moçambique or República de Moçambique, pronounced [ʁɛˈpuβlikɐ ðɨ musɐ̃ˈbikɨ], Chichewa: Mozambiki, Swahili: Msumbiji, Tsonga: Muzambhiki), is a country located in Southeast Africa bordered by the Indian Ocean to the east, Tanzania to the north, Malawi and Zambia to the northwest, Zimbabwe to the west, and Eswatini (Swaziland) and South Africa to the southwest. The sovereign state is separated from the Comoros, Mayotte and Madagascar by the Mozambique Channel to the east. The capital of Mozambique is Maputo (formerly known as "Lourenço Marques" from 1876 to 1976) while Matola is the largest city, being a suburb of Maputo. Between the first and fifth centuries AD, Bantu-speaking peoples migrated to present-day Mozambique from farther north and west. Northern Mozambique lies within the monsoon trade winds of the Indian Ocean. Between the 7th and 11th centuries, a series of Swahili port towns developed here, which contributed to the development of a distinct Swahili culture and language. In the late medieval period, these towns were frequented by traders from Somalia, Ethiopia, Egypt, Arabia, Persia, and India. Mozambique is endowed with rich and extensive natural resources. The country's economy is based largely on agriculture, but industry is growing, mainly food and beverages, chemical manufacturing and aluminium and petroleum production. The tourism sector is also expanding. South Africa is Mozambique's main trading partner and source of foreign direct investment, while Belgium, Brazil, Portugal and Spain are also among the country's most important economic partners. Since 2001, Mozambique's annual average GDP growth has been among the world's highest. However, the country is still one of the poorest and most underdeveloped countries in the world, ranking low in GDP per capita, human development, measures of inequality and average life expectancy. The only official language of Mozambique is Portuguese, which is spoken mostly as a second language by about half the population. Common native languages include Makhuwa, Sena, and Swahili. The country's population of around 29 million is composed overwhelmingly of Bantu people. The largest religion in Mozambique is Christianity, with significant minorities following Islam and African traditional religions. Mozambique is a member of the United Nations, the African Union, the Commonwealth of Nations, the Organisation of the Islamic Cooperation, the Community of Portuguese Language Countries, the Non-Aligned Movement and the Southern African Development Community, and is an observer at La Francophonie. The country was named Moçambique by the Portuguese after the Island of Mozambique, derived from Mussa Bin Bique or Musa Al Big or Mossa Al Bique or Mussa Ben Mbiki or Mussa Ibn Malik, an Arab trader who first visited the island and later lived there. The island-town was the capital of the Portuguese colony until 1898, when it was moved south to Lourenço Marques (now Maputo). Between the 1st and 5th centuries AD, waves of Bantu-speaking people migrated from the west and north through the Zambezi River valley and then gradually into the plateau and coastal areas. They established agricultural communities or societies based on herding cattle. They brought with them the technology for smelting and smithing iron. From the late first millennium AD, vast Indian Ocean trade networks extended as far south into Mozambique as evidenced by the ancient port town of Chibuene. Beginning in the 9th century, a growing involvement in Indian Ocean trade led to the development of numerous port towns along the entire East African coast, including modern day Mozambique. Largely autonomous, these towns broadly participated in the incipient Swahili culture. Islam was often adopted by urban elites, facilitating trade. In Mozambique, Sofala, Angoche, and Mozambique Island were regional powers by the 15th century. The towns traded with merchants from both the African interior and the broader Indian Ocean world. Particularly important were the gold and ivory caravan routes. Inland states like the Kingdom of Zimbabwe and Kingdom of Mutapa provided the coveted gold and ivory, which were then exchanged up the coast to larger port cities like Kilwa and Mombasa. From about 1500, Portuguese trading posts and forts displaced the Arabic commercial and military hegemony, becoming regular ports of call on the new European sea route to the east. The voyage of Vasco da Gama around the Cape of Good Hope in 1498 marked the Portuguese entry into trade, politics, and society of the region. The Portuguese gained control of the Island of Mozambique and the port city of Sofala in the early 16th century, and by the 1530s, small groups of Portuguese traders and prospectors seeking gold penetrated the interior regions, where they set up garrisons and trading posts at Sena and Tete on the River Zambezi and tried to gain exclusive control over the gold trade. In the central part of the Mozambique territory, the Portuguese attempted to legitimise and consolidate their trade and settlement positions through the creation of prazos (land grants) tied to their settlement and administration. While prazos were originally developed to be held by Portuguese, through intermarriage they became African Portuguese or African Indian centres defended by large African slave armies known as Chikunda. [clarification needed] Historically within Mozambique there was slavery. Human beings were bought and sold by African tribal chiefs, first to Arab Muslim traders and sent to Middle East Asia cities and plantations, and later to Portuguese and other European traders as well. Many Mozambican slaves were supplied by tribal chiefs who raided warring tribes and sold their captives to the prazeiros. Although Portuguese influence gradually expanded, its power was limited and exercised through individual settlers and officials who were granted extensive autonomy. The Portuguese were able to wrest much of the coastal trade from Arab Muslims between 1500 and 1700, but, with the Arab Muslim seizure of Portugal's key foothold at Fort Jesus on Mombasa Island (now in Kenya) in 1698, the pendulum began to swing in the other direction. As a result, investment lagged while Lisbon devoted itself to the more lucrative trade with India and the Far East and to the colonisation of Brazil. During these wars, the Mazrui and Omani Arabs reclaimed much of the Indian Ocean trade, forcing the Portuguese to retreat south. Many prazos had declined by the mid-19th century, but several of them survived. During the 19th century other European powers, particularly the British (British South Africa Company) and the French (Madagascar), became increasingly involved in the trade and politics of the region around the Portuguese East African territories. By the early 20th century the Portuguese had shifted the administration of much of Mozambique to large private companies, like the Mozambique Company, the Zambezia Company and the Niassa Company, controlled and financed mostly by "British" financiers such as Solomon Joel, which established railroad lines to their neighbouring colonies (South Africa and Rhodesia). Although slavery had been legally abolished in Mozambique, at the end of the 19th century the Chartered companies enacted a forced labour policy and supplied cheap—often forced—African labour to the mines and plantations of the nearby British colonies and South Africa. The Zambezia Company, the most profitable chartered company, took over a number of smaller prazeiro holdings, and established military outposts to protect its property. The chartered companies built roads and ports to bring their goods to market including a railroad linking present day Zimbabwe with the Mozambican port of Beira. Due to their unsatisfactory performance and the shift, under the corporatist Estado Novo regime of Oliveira Salazar, towards a stronger Portuguese control of Portuguese Empire's economy, the companies' concessions were not renewed when they ran out. This was what happened in 1942 with the Mozambique Company, which however continued to operate in the agricultural and commercial sectors as a corporation, and had already happened in 1929 with the termination of the Niassa Company's concession. In 1951, the Portuguese overseas colonies in Africa were rebranded as Overseas Provinces of Portugal. 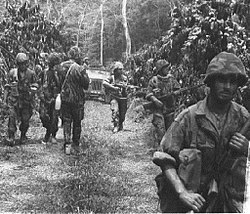 Portuguese troops during the Portuguese Colonial War, some loading FN FAL and G3. As communist and anti-colonial ideologies spread out across Africa, many clandestine political movements were established in support of Mozambican independence. These movements claimed that since policies and development plans were primarily designed by the ruling authorities for the benefit of Mozambique's Portuguese population, little attention was paid to Mozambique's tribal integration and the development of its native communities. According to the official guerrilla statements, this affected a majority of the indigenous population who suffered both state-sponsored discrimination and enormous social pressure. Many felt they had received too little opportunity or resources to upgrade their skills and improve their economic and social situation to a degree comparable to that of the Europeans. Statistically, Mozambique's Portuguese whites were indeed wealthier and more skilled than the black indigenous majority. As a response to the guerrilla movement, the Portuguese government from the 1960s and principally the early 1970s, initiated gradual changes with new socioeconomic developments and egalitarian policies for all. The Front for the Liberation of Mozambique (FRELIMO) initiated a guerrilla campaign against Portuguese rule in September 1964. This conflict—along with the two others already initiated in the other Portuguese colonies of Angola and Portuguese Guinea—became part of the so-called Portuguese Colonial War (1961–1974). From a military standpoint, the Portuguese regular army maintained control of the population centres while the guerrilla forces sought to undermine their influence in rural and tribal areas in the north and west. As part of their response to FRELIMO, the Portuguese government began to pay more attention to creating favourable conditions for social development and economic growth. FRELIMO took control of the territory after 10 years of sporadic warfare, as well as Portugal's own return to democracy after the fall of the authoritarian Estado Novo regime the Carnation Revolution of April 1974, and the failed coup of 25 November 1975. Within a year, most of the 250,000 Portuguese in Mozambique had left—some expelled by the government of the nearly independent territory, some fleeing in fear—and Mozambique became independent from Portugal on 25 June 1975. A law had been passed on the initiative of the relatively unknown Armando Guebuza of the FRELIMO party, ordering the Portuguese to leave the country in 24 hours with only 20 kilograms (44 pounds) of luggage. Unable to salvage any of their assets, most of them returned to Portugal penniless. The new government under president Samora Machel established a one-party state based on Marxist principles. It received diplomatic and some military support from Cuba and the Soviet Union and proceeded to crack down on opposition. Starting shortly after the independence, the country was plagued from 1977 to 1992 by a long and violent civil war between the opposition forces of anti-Communist Mozambican National Resistance (RENAMO) rebel militias and the FRELIMO regime. This conflict characterised the first decades of Mozambican independence, combined with sabotage from the neighbouring states of Rhodesia and South Africa, ineffective policies, failed central planning, and the resulting economic collapse. This period was also marked by the exodus of Portuguese nationals and Mozambicans of Portuguese heritage, a collapsed infrastructure, lack of investment in productive assets, and government nationalisation of privately owned industries, as well as widespread famine. During most of the civil war, the FRELIMO-formed central government was unable to exercise effective control outside of urban areas, many of which were cut off from the capital. RENAMO-controlled areas included up to 50% of the rural areas in several provinces, and it is reported that health services of any kind were isolated from assistance for years in those areas. The problem worsened when the government cut back spending on health care. The war was marked by mass human rights violations from both sides of the conflict, with RENAMO contributing to the chaos through the use of terror and indiscriminate targeting of civilians. The central government executed tens of thousands of people while trying to extend its control throughout the country and sent many people to "re-education camps" where thousands died. During the war, RENAMO proposed a peace agreement based on the secession of RENAMO-controlled northern and western territories as the independent Republic of Rombesia, but FRELIMO refused, insisting on the undivided sovereignty of the entire country. An estimated one million Mozambicans perished during the civil war, 1.7 million took refuge in neighbouring states, and several million more were internally displaced. The FRELIMO regime also gave shelter and support to South African (African National Congress) and Zimbabwean (Zimbabwe African National Union) rebel movements, while the governments of Rhodesia and later South Africa (at that time still apartheid) backed RENAMO in the civil war. On 19 October 1986, Samora Machel was on his way back from an international meeting in Zambia in the presidential Tupolev Tu-134 aircraft when the plane crashed in the Lebombo Mountains near Mbuzini. There were ten survivors, but President Machel and thirty-three others died, including ministers and officials of the Mozambique government. The United Nations' Soviet delegation issued a minority report contending that their expertise and experience had been undermined by the South Africans. Representatives of the Soviet Union advanced the theory that the plane had been intentionally diverted by a false navigational beacon signal, using a technology provided by military intelligence operatives of the South African government. Machel's successor Joaquim Chissano implemented sweeping changes in the country, starting reforms such as changing from Marxism to capitalism, and began peace talks with RENAMO. The new constitution enacted in 1990 provided for a multi-party political system, market-based economy, and free elections. The civil war ended in October 1992 with the Rome General Peace Accords, first brokered by the Christian Council of Mozambique (Council of Protestant Churches) and then taken over by Community of Sant'Egidio. Peace returned to Mozambique, under supervision of the ONUMOZ peacekeeping force of the United Nations. A US helicopter flying over the flooded Limpopo River during the 2000 Mozambique flood. Mozambique held elections in 1994, which were accepted by most political parties as free and fair although still contested by many nationals and observers alike. FRELIMO won, under Joaquim Chissano, while RENAMO, led by Afonso Dhlakama, ran as the official opposition. In 1995, Mozambique joined the Commonwealth of Nations, becoming, at the time, the only member nation that had never been part of the British Empire. By mid-1995, over 1.7 million refugees who had sought asylum in neighbouring countries had returned to Mozambique, part of the largest repatriation witnessed in sub-Saharan Africa. An additional four million internally displaced persons had returned to their homes. In December 1999, Mozambique held elections for a second time since the civil war, which were again won by FRELIMO. RENAMO accused FRELIMO of fraud, and threatened to return to civil war, but backed down after taking the matter to the Supreme Court and losing. In early 2000, a cyclone caused widespread flooding in the country, killing hundreds and devastating the already precarious infrastructure. There were widespread suspicions that foreign aid resources had been diverted by powerful leaders of FRELIMO. Carlos Cardoso, a journalist investigating these allegations, was murdered, and his death was never satisfactorily explained. Indicating in 2001 that he would not run for a third term, Chissano criticised leaders who stayed on longer than he had, which was generally seen as a reference to Zambian president Frederick Chiluba, who at the time was considering a third term, and Zimbabwean president Robert Mugabe, then in his fourth term. Presidential and National Assembly elections took place on 1–2 December 2004. FRELIMO candidate Armando Guebuza won with 64% of the popular vote, while his opponent, Afonso Dhlakama of RENAMO, received 32% of the popular vote. FRELIMO won 160 seats in Parliament, with a coalition of RENAMO and several small parties winning the 90 remaining seats. Guebuza was inaugurated as the President of Mozambique on 2 February 2005, and served two five-year terms. His successor, Filipe Nyusi, became the 4th President of Mozambique on 15 January 2015. Since 2013, a low-intensity insurgency by RENAMO has been occurring, mainly in the country's central and northern regions. On 5 September 2014, former president Guebuza and the leader of RENAMO Dhlakama signed the Accord on Cessation of Hostilities, which brought the military hostilities to a halt and allowed both parties to concentrate on the general elections to be held in October 2014. However, after the general elections, a new political crisis emerged and the country appears to be once again on the brink of violent conflict. RENAMO does not recognise the validity of the election results, and demands the control of six provinces – Nampula, Niassa, Tete, Zambezia, Sofala, and Manica – where they claim to have won a majority. About 12,000 refugees are now in neighbouring Malawi. The UNHCR, Doctors Without Borders, and Human Rights Watch have reported that government forces have torched villages and carried out summary executions and sexual abuses. At 309,475 sq mi (801,537 km2), Mozambique is the world's 36th-largest country. It is comparable in size to Turkey. Mozambique is located on the southeast coast of Africa. It is bound by Swaziland to the south, South Africa to the southwest, Zimbabwe to the west, Zambia and Malawi to the northwest, Tanzania to the north and the Indian Ocean to the east. Mozambique lies between latitudes 10° and 27°S, and longitudes 30° and 41°E. The country is divided into two topographical regions by the Zambezi River. To the north of the Zambezi River, the narrow coastal strip gives way to inland hills and low plateaus. 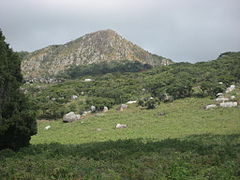 Rugged highlands are further west; they include the Niassa highlands, Namuli or Shire highlands, Angonia highlands, Tete highlands and the Makonde plateau, covered with miombo woodlands. To the south of the Zambezi River, the lowlands are broader with the Mashonaland plateau and Lebombo Mountains located in the deep south. The country is drained by five principal rivers and several smaller ones with the largest and most important the Zambezi. The country has four notable lakes: Lake Niassa (or Malawi), Lake Chiuta, Lake Cahora Bassa and Lake Shirwa, all in the north. The major cities are Maputo, Beira, Nampula, Tete, Quelimane, Chimoio, Pemba, Inhambane, Xai-Xai and Lichinga. Mozambique has a tropical climate with two seasons, a wet season from October to March and a dry season from April to September. Climatic conditions, however, vary depending on altitude. Rainfall is heavy along the coast and decreases in the north and south. Annual precipitation varies from 500 to 900 mm (19.7 to 35.4 in) depending on the region, with an average of 590 mm (23.2 in). Cyclones are common during the wet season. Average temperature ranges in Maputo are from 13 to 24 °C (55.4 to 75.2 °F) in July and from 22 to 31 °C (71.6 to 87.8 °F) in February. Protected areas of Mozambique include thirteen forest reserves, seven national parks, six nature reserves, three frontier conservation areas and three wildlife or game reserves. Mozambique is a multi-party democracy under the 1990 constitution. The executive branch comprises a President, Prime Minister, and Council of Ministers. There is a National Assembly and municipal assemblies. The judiciary comprises a Supreme Court and provincial, district, and municipal courts. Suffrage is universal at eighteen. In the 1994 elections, Joaquim Chissano was elected President with 53% of the vote, and a 250-member National Assembly was voted in with 129 Liberation Front of Mozambique (FRELIMO) deputies, 112 Mozambican National Resistance (RENAMO) deputies, and nine representatives of three smaller parties that formed the Democratic Union (UD). Since its formation in 1994, the National Assembly has made progress in becoming a body increasingly more independent of the executive. By 1999, more than one-half (53%) of the legislation passed originated in the Assembly. In the aftermath of the 1998 local elections, the government resolved to make more accommodations to the opposition's procedural concerns for the second round of multiparty national elections in 1999. Working through the National Assembly, the electoral law was rewritten and passed by consensus in December 1998. Financed largely by international donors, a very successful voter registration was conducted from July to September 1999, providing voter registration cards to 85% of the potential electorate (more than seven million voters). The second general elections were held 3–5 December 1999, with high voter turnout. International and domestic observers agreed that the voting process was well organised and went smoothly. Both the opposition and observers subsequently cited flaws in the tabulation process that, had they not occurred, might have changed the outcome. In the end, however, international and domestic observers concluded that the close result of the vote reflected the will of the people. President Chissano won the presidency with a margin of 4% over the RENAMO-Electoral Union coalition candidate, Afonso Dhlakama, and began his five-year term in January 2000. FRELIMO increased its majority in the National Assembly with 133 out of 250 seats. RENAMO-UE coalition won 116 seats, one went independent, and no third parties are represented. The second local elections, involving thirty-three municipalities with some 2.4 million registered voters, took place in November 2003. This was the first time that FRELIMO, RENAMO-UE, and independent parties competed without significant boycotts. The 24% turnout was well above the 15% turnout in the first municipal elections. FRELIMO won twenty-eight mayoral positions and the majority in twenty-nine municipal assemblies, while RENAMO won five mayoral positions and the majority in four municipal assemblies. The voting was conducted in an orderly fashion without violent incidents. However, the period immediately after the elections was marked by objections about voter and candidate registration and vote tabulation, as well as calls for greater transparency. In May 2009, the government approved a new general elections law that contained innovations based on the experience of the 2003 municipal elections. Presidential and National Assembly elections took place on 1–2 December 2004. FRELIMO candidate Armando Guebuza won with 64% of the popular vote. His opponent, Afonso Dhlakama of RENAMO, received 32% of the popular vote. FRELIMO won 160 seats in Parliament. A coalition of RENAMO and several small parties won the 90 remaining seats. Armando Guebuza was inaugurated as the President of Mozambique on 2 February 2005. RENAMO and some other opposition parties made claims of election fraud and denounced the result. These claims were supported by international observers (among others by the European Union Election Observation Mission to Mozambique and the Carter Centre) to the elections who criticised the fact that the National Electoral Commission (CNE) did not conduct fair and transparent elections. They listed a whole range of shortcomings by the electoral authorities that benefited the ruling party FRELIMO. According to EU observers, the elections shortcomings have probably not affected the final result in the presidential election. On the other hand, the observers have declared that the outcome of the parliamentary election and thus the distribution of seats in the National Assembly does not reflect the will of the Mozambican people and is clearly to the disadvantage of RENAMO. After clashes between RENAMO guards and the police in Muxungue and Gondola in April 2013, RENAMO said it would boycott and disrupt local elections in November 2013. Since the end of the civil war in 1992, about 300 RENAMO guards had remained armed and refused to join the national army or the police force. Mozambique's embassy in Washington, D.C. While allegiances dating back to the liberation struggle remain relevant, Mozambique's foreign policy has become increasingly pragmatic. The twin pillars of Mozambique's foreign policy are maintenance of good relations with its neighbours and maintenance and expansion of ties to development partners. During the 1970s and the early 1980s, Mozambique's foreign policy was inextricably linked to the struggles for majority rule in Rhodesia and South Africa as well as superpower competition and the Cold War. Mozambique's decision to enforce UN sanctions against Rhodesia and deny that country access to the sea led Ian Smith's government to undertake overt and covert actions to oppose the country. Although the change of government in Zimbabwe in 1980 removed this threat, the government of South Africa continued to destabilise Mozambique. Mozambique also belonged to the Front Line States. The 1984 Nkomati Accord, while failing in its goal of ending South African support to RENAMO, opened initial diplomatic contacts between the Mozambican and South African governments. This process gained momentum with South Africa's elimination of apartheid, which culminated in the establishment of full diplomatic relations in October 1993. While relations with neighbouring Zimbabwe, Malawi, Zambia and Tanzania show occasional strains, Mozambique's ties to these countries remain strong. In the years immediately following its independence, Mozambique benefited from considerable assistance from some Western countries, notably the Scandinavians. The Soviet Union and its allies became Mozambique's primary economic, military and political supporters, and its foreign policy reflected this linkage. This began to change in 1983; in 1984 Mozambique joined the World Bank and International Monetary Fund. Western aid by the Scandinavian countries of Sweden, Norway, Denmark and Iceland quickly replaced Soviet support. Finland and the Netherlands are becoming increasingly important sources of development assistance. Italy also maintains a profile in Mozambique as a result of its key role during the peace process. Relations with Portugal, the former colonial power, continue to be important because Portuguese investors play a visible role in Mozambique's economy. Mozambique is a member of the Non-Aligned Movement and ranks among the moderate members of the African bloc in the United Nations and other international organisations. Mozambique also belongs to the African Union (formerly the Organisation of African Unity) and the Southern African Development Community. In 1994, the government became a full member of the Organisation of the Islamic Conference, in part to broaden its base of international support but also to please the country's sizeable Muslim population. Similarly, in 1995 Mozambique joined its Anglophone neighbours in the Commonwealth of Nations. At the time it was the only nation to have joined the Commonwealth that was never part of the British Empire. In the same year, Mozambique became a founding member and the first President of the Community of Portuguese Language Countries (CPLP), and maintains close ties with other Portuguese-speaking countries. Mozambique is divided into ten provinces (provincias) and one capital city (cidade capital) with provincial status. The provinces are subdivided into 129 districts (distritos). The districts are further divided in 405 "Postos Administrativos" (Administrative Posts) and then into Localidades (Localities), the lowest geographical level of the central state administration. Since 1998, 53 "Municípios" (Municipalities) have been created in Mozambique. The districts of Mozambique are divided into 405 postos. Postos administrativos (administrative posts) are the main subdivisions of districts. This name, in use during colonial times, was abolished after independence and was replaced by localidades (localities). However, it was re-established in 1986. Administrative posts are headed by a Secretários (secretaries), which before independence were called Chefes de Posto (post chiefs). Administrative posts can be further subdivided into localities, also headed by secretaries. Mozambique operates a small, functioning military that handles all aspects of domestic national defence, the Mozambique Defence Armed Forces. The official currency is the New Metical (as of March 2018, US$1 is roughly equivalent to 62 New Meticals), which replaced old Meticals at the rate of a thousand to one. The old currency was redeemable at the Bank of Mozambique until the end of 2012. The US$, South African rand, and recently the euro are also widely accepted and used in business transactions. The minimum legal salary is around US$60 per month. Mozambique is a member of the Southern African Development Community (SADC). The SADC free trade protocol is aimed at making the Southern African region more competitive by eliminating tariffs and other trade barriers. The World Bank in 2007 talked of Mozambique's 'blistering pace of economic growth'. A joint donor-government study in early 2007 said 'Mozambique is generally considered an aid success story.' The IMF in early 2007 said 'Mozambique is a success story in Sub-Saharan Africa.' Yet, despite this apparent success, both the World Bank and UNICEF used the word 'paradox' to describe rising chronic child malnutrition in the face of GDP growth. Between 1994 and 2006, average annual GDP growth was approximately 8%, however, the country remains one of the poorest and most underdeveloped in the world. In a 2006 survey, three-quarters of Mozambicans said that in the past five years their economic position had remained the same or become worse. The resettlement of civil war refugees and successful economic reform have led to a high growth rate: the country enjoyed a remarkable recovery, achieving an average annual rate of economic growth of 8% between 1996 and 2006 and between 6–7% from 2006 to 2011. The devastating floods of early 2000 slowed GDP growth to 2.1%, but a full recovery was achieved in 2001 with growth of 14.8%.. Rapid expansion in the future hinged on several major foreign investment projects, continued economic reform, and the revival of the agriculture, transportation, and tourism sectors. In 2013 about 80% of the population was employed in agriculture, the majority of whom were engaged in small-scale subsistence farming which still suffered from inadequate infrastructure, commercial networks, and investment. However, in 2012, more than 90% of Mozambique's arable land was still uncultivated. In 2013, a BBC article reported that, starting in 2009, Portuguese had been returning to Mozambique because of the growing economy in Mozambique and the poor economic situation in Portugal. More than 1,200 mostly small state-owned enterprises have been privatised. Preparations for privatisation and/or sector liberalisation were made for the remaining parastatal enterprises, including telecommunications, energy, ports, and railways. The government frequently selected a strategic foreign investor when privatising a parastatal. Additionally, customs duties have been reduced, and customs management has been streamlined and reformed. The government introduced a value-added tax in 1999 as part of its efforts to increase domestic revenues. Plans for 2003–04 included Commercial Code reform; comprehensive judicial reform; financial sector strengthening; continued civil service reform; and improved government budget, audit, and inspection capability. Further political instability resulting from flooding left thousands homeless, displaced within their own country. Mozambique's economy has been shaken by a number of corruption scandals. In July 2011, the government proposed new anti-corruption laws to criminalise embezzlement, influence peddling and graft, following numerous instances of the theft of public money. This has been endorsed by the country's Council of Ministers. Mozambique has convicted two former ministers for graft in the past two years. Mozambique was ranked 116 of 178 countries in anti-graft watchdog Transparency International's latest index of global corruption. According to a USAID report written in 2005, "the scale and scope of corruption in Mozambique are cause for alarm." In March 2012, the government of the southern Mozambican province of Inhambane uncovered the misappropriation of public funds by the director of the Provincial Anti-Drugs Office, Calisto Alberto Tomo. He was found to have colluded with the accountant in the Anti-Drugs Office, Recalda Guambe, to steal over 260,000 meticais between 2008 and 2010. The government of Mozambique has taken steps to address the problem of corruption, and some positive developments can be observed, such as the passages of several new anti-corruption bills in 2012. In 2010-2011 the American company Anadarko Petroleum Corporation and the Italian company Eni (the Mamba South gas field) discovered recoverable reserves of 4,200 billion cubic metres (150 trillion cubic feet) of natural gas in the Rovuma Basin, off the coast of northern Cabo Delgado Province. Once developed, this could make Mozambique one of the largest producers of liquefied natural gas in the world. In January 2017, 3 firms were selected by the Mozambique Government for the Natural Gas Development Projects in the Rovuma gas basin. GL Africa Energy (UK) was awarded one of the tenders. It plans to build and operate a 250 MW gas-powered plant. Production is scheduled to start in 2018. Mozambique attracts tourists. The country's natural environment, wildlife, and historic heritage provide opportunities for beach, cultural, and eco-tourism. Mozambique has a great potential for growth in its gross domestic product (GDP), although its current contribution is only 5.6%. The beaches with clean water are suitable for tourism,[original research?] especially those that are very far from urban centers, such as those in the province of Cabo Delgado, especially the Quirimbas Islands, and the province of Inhambane, especially the Archipelago of Bazaruto. The country also has several national parks, including Gorongosa National Park, with its infrastructures rehabilitated and repopulated in certain species of animals that were already disappearing. Steam locomotive at Inhambane, 2009. Modes of transport in Mozambique include rail, road, water, and air. There are over 30,000 km of roads, but much of the network is unpaved. Like its Commonwealth neighbours, traffic circulates on the left. There is an international airport at Maputo, 21 other paved airports, and over 100 airstrips with unpaved runways. On the Indian Ocean coast are several large seaports, including Nacala, Beira and Maputo, with further ports being developed. There are 3,750 km of navigable inland waterways. There are rail links serving principal cities and connecting the country with Malawi, Zimbabwe and South Africa. The Mozambican railway system developed over more than a century from three different ports on the Indian Ocean that served as terminals for separate lines to the hinterland. 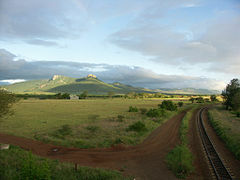 The railroads were major targets during the Mozambican Civil War, were sabotaged by RENAMO, and are being rehabilitated. A parastatal authority, Portos e Caminhos de Ferro de Moçambique (abbreviated CFM; in English Mozambique Ports and Railways), oversees the railway system of Mozambique and its connected ports, but management has been largely outsourced. Each line has its own development corridor. As of 2005[update] there were 3,123 km of railway track, consisting of 2,983 km of 1,067 mm (3 ft 6 in) gauge, compatible with neighbouring rail systems, and a 140 km line of 762 mm (2 ft 6 in) gauge, the Gaza Railway. The central Beira Railroad Corporation route links the port of Beira to the landlocked countries of Malawi, Zambia and Zimbabwe. To the north of this the port of Nacala is also linked by rail to Malawi, and to the south Maputo is linked to Zimbabwe and South Africa. These networks interconnect only via neighbouring countries. A new route for coal haulage between Tete and Beira was planned to come into service by 2010, and in August 2010, Mozambique and Botswana signed a memorandum of understanding to develop a 1,100 km railway through Zimbabwe, to carry coal from Serule in Botswana to a deepwater port at Techobanine Point in Mozambique. Newer rolling stock has been supplied by the Indian Golden Rock workshop using Centre Buffer Couplers (AAR) and air brakes. Woman fetching water during the dry season from a polluted source in Machaze District of the Central Manica Province. Water supply and sanitation in Mozambique is characterised by low levels of access to an improved water source (estimated to be 51% in 2011), low levels of access to adequate sanitation (estimated to be 25% in 2011) and mostly poor service quality. In 2007 the government has defined a strategy for water supply and sanitation in rural areas, where 62% of the population lives. In urban areas, water is supplied by informal small-scale providers and by formal providers. Beginning in 1998, Mozambique has reformed the formal part of the urban water supply sector through the creation of an independent regulatory agency called CRA, an asset-holding company called FIPAG and a Public-private partnership (PPP) with a company called Aguas de Moçambique. The PPP covered those areas of the capital and of four other cities that had access to formal water supply systems. However, the PPP ended when the management contracts for four cities expired in 2008 and when the foreign partner of the company that serves the capital under a lease contract withdrew in 2010, claiming heavy losses. While urban water supply has received considerable policy attention, the government has no strategy for urban sanitation yet. External donors finance about 87.4% of all public investments in the sector. The main donors in the water sector are the World Bank, the African Development Bank, Canada, the Netherlands, Sweden, Switzerland and the United States. The north-central provinces of Zambezia and Nampula are the most populous, with about 45% of the population. The estimated four million Macua are the dominant group in the northern part of the country; the Sena and Shona (mostly Ndau) are prominent in the Zambezi valley, and the Tsonga and Shangaan people dominate in southern Mozambique. Other groups include Makonde, Yao, Swahili, Tonga, Chopi, and Nguni (including Zulu). Bantu people comprise 97.8% of the population, with the rest made up of White Africans (largely of Portuguese ancestry), Euro-Africans (mestiço people of mixed Bantu and Portuguese ancestry), and Indians. Roughly 45,000 people of Indian descent reside in Mozambique. During Portuguese colonial rule, a large minority of people of Portuguese descent lived permanently in almost all areas of the country, and Mozambicans with Portuguese heritage at the time of independence numbered about 360,000. Many of these left the country after independence from Portugal in 1975. There are various estimates for the size of Mozambique's Chinese community, ranging from 7,000 to 12,000 as of 2007[update]. According to a 2011 survey, the total fertility rate was 5.9 children per woman, with 6.6 in rural areas and 4.5 in urban areas. Portuguese is the official and most widely spoken language of the nation, spoken by 50.3% of the population. Most Mozambicans living in the cities speak Portuguese as their first language. The Bantu-group languages of Mozambique that are indigenous to the country vary greatly in their groupings and in some cases are rather poorly appreciated and documented. Apart from its lingua franca uses in the north of the country, Swahili is spoken in a small area of the coast next to the Tanzanian border; south of this, towards Moçambique Island, Kimwani, regarded as a dialect of Swahili, is used. Immediately inland of the Swahili area, Makonde is used, separated farther inland by a small strip of Makhuwa-speaking territory from an area where Yao or ChiYao is used. Makonde and Yao belong to a different group, Yao being very close to the Mwera language of the Rondo Plateau area in Tanzania. Prepositions appear in these languages as locative prefixes prefixed to the noun and declined according to their own noun-class. Some Nyanja is used at the coast of Lake Malawi, as well as on the other side of the Lake. Somewhat different from all of these are the languages of the eMakhuwa group, with a loss of initial k-, which means that many nouns begin with a vowel: for example, epula = "rain". 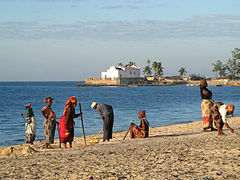 There is eMakhuwa proper, with the related eLomwe and eChuwabo, with a small eKoti-speaking area at the coast. In an area straddling the lower Zambezi, Sena, which belongs to the same group as Nyanja, is spoken, with areas speaking the related CiNyungwe and CiSenga further upriver. A large Shona-speaking area extends between the Zimbabwe border and the sea: this was formerly known the Ndau variety but now uses the orthography of the Standard Shona of Zimbabwe. 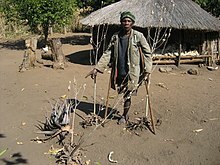 Apparently similar to Shona, but lacking the tone patterns of the Shona language, and regarded by its speakers as quite separate, is CiBalke, also called Rue or Barwe, used in a small area near the Zimbabwe border. South of this area are languages of the Tsonga group, which are quite different again. XiTswa or Tswa occurs at the coast and inland, XiTsonga or Tsonga straddles the area around the Limpopo River, including such local dialects as XiHlanganu, XiN'walungu, XiBila, XiHlengwe, and XiDzonga. This language area extends into neighbouring South Africa. Still related to these, but distinct, are GiTonga and CiCopi or Chopi, spoken north of the mouth of the Limpopo, and XiRonga or Ronga, spoken in the immediate region around Maputo. The languages in this group are, judging by the short vocabularies, very vaguely similar to Zulu, but obviously not in the same immediate group. There are small Swazi- and Zulu-speaking areas in Mozambique immediately next to the Swaziland and KwaZulu-Natal borders. Arabs, Chinese, and Indians primarily speak Portuguese and some Hindi. Indians from Portuguese India speak any of the Portuguese Creoles of their origin aside from Portuguese as their second language. The 2007 census found that Christians made up 56.1% of Mozambique's population and Muslims comprised 17.9% of the population. 7.3% of the people held other beliefs, mainly animism, and 18.7% had no religious beliefs. A more recent government survey conducted by the Demographic and Health Surveys Program in 2015 indicated that Catholicism had increased to 30.5% of the population, Muslims constituted 19.3%, and various Protestant groups a total of 44%. The Roman Catholic Church has established twelve dioceses (Beira, Chimoio, Gurué, Inhambane, Lichinga, Maputo, Nacala, Nampula, Pemba, Quelimane, Tete, and Xai-Xai; archdioceses are Beira, Maputo and Nampula). Statistics for the dioceses range from a low 5.8% Catholics in the population in the diocese of Chimoio, to 32.50% in Quelimane diocese (Anuario catolico de Mocambique 2007). The work of Methodism in Mozambique started in 1890. The Rev. Dr. Erwin Richards began a Methodist mission at Chicuque in Inhambane Province. A Igreja Metodista Unida em Moçambique (the UMC in Mozambique) observed the 100th anniversary of Methodist presence in Mozambique in 1990. Then-Mozambique President Chissano praised the work and role of the UMC to more than 10,000 people who attended the ceremony. The United Methodist Church has tripled in size in Mozambique since 1998. There are now more than 150,000 members in more than 180 congregations of the 24 districts. New pastors are ordained each year. New churches are chartered each year in each Annual Conference (North and South). The Church of Jesus Christ of Latter-day Saints (LDS Church) has established a growing presence in Mozambique. It first began sending missionaries to Mozambique in 1999, and, as of April 2015, has more than 7,943 members. The Bahá'í Faith has been present in Mozambique since the early 1950s but did not openly identify itself in those years because of the strong influence of the Catholic Church which did not recognise it officially as a world religion. The independence in 1975 saw the entrance of new pioneers. In total, there are about 3,000 declared Baha'is in Mozambique as of 2010[update]. The Administrative Committee is located in Maputo. Muslims are particularly present in the north of the country. They are organised in several "tariqa" or brotherhoods. Two national organisations also exist—the Conselho Islâmico de Moçambique and the Congresso Islâmico de Moçambique. There are also important Pakistani, Indian associations as well as some Shia communities. Among the main Protestant churches are Igreja União Baptista de Moçambique, the Assembleias de Deus, the Seventh-day Adventists, the Anglican Church of Southern Africa, the Igreja do Evangelho Completo de Deus, the Igreja Metodista Unida, the Igreja Presbiteriana de Moçambique, the Igrejas de Cristo and the Assembleia Evangélica de Deus. There is a very small but thriving Jewish community in Maputo. The fertility rate is at about 5.5 births per woman. Public expenditure on health was at 2.7% of the GDP in 2004, whereas private expenditure on health was at 1.3% in the same year. Health expenditure per capita was 42 US$ (PPP) in 2004. In the early 21st century there were 3 physicians per 100,000 people in the country. Infant mortality was at 100 per 1,000 births in 2005. The 2010 maternal mortality rate per 100,000 births for Mozambique is 550. This is compared with 598.8 in 2008 and 385 in 1990. The under 5 mortality rate, per 1,000 births is 147 and the neonatal mortality as a percentage of under 5s mortality is 29. In Mozambique the number of midwives per 1,000 live births is 3 and the lifetime risk of death for pregnant women 1 in 37. The official HIV prevalence in Mozambique in 2011 was 11.5% of the population aged between 15 and 49 years. In the southern parts of Mozambique—Maputo and Gaza provinces as well as the city of Maputo—the official figures are more than twice as high as the national average. In 2011 the health authorities estimated about 1.7 million Mozambicans were HIV-positive, of whom 600,000 were in need of anti-retroviral treatment. As of December 2011, 240,000 were receiving such treatment, increasing to 416,000 in March 2014 according to the health authorities. According to the 2011 UNAIDS Report, the HIV/AIDS epidemic in Mozambique seems to be levelling off. Portuguese is the primary language of instruction in all of the Mozambican schools. All Mozambicans are required by law to attend school through the primary level; however, a lot of children in Mozambique do not go to primary school because they have to work for their families' subsistence farms for a living. In 2007, one million children still did not go to school, most of them from poor rural families, and almost half of all teachers in Mozambique were still unqualified. Girls’ enrolment increased from 3 million in 2002 to 4.1 million in 2006 while the completion rate increased from 31,000 to 90,000, which testified a very poor completion rate. After grade 7, pupils must take standardised national exams to enter secondary school, which runs from eighth to 10th grade. Space in Mozambican universities is extremely limited; thus most pupils who complete pre-university school do not immediately proceed on to university studies. Many go to work as teachers or are unemployed. There are also institutes which give more vocational training, specialising in agricultural, technical or pedagogical studies, which students may attend after grade 10 in lieu of a pre-university school. 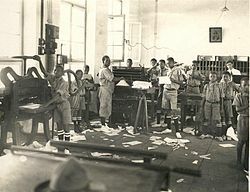 After independence from Portugal in 1975, a number of Mozambican pupils continued to be admitted every year at Portuguese high schools, polytechnical institutes and universities, through bilateral agreements between the Portuguese government and the Mozambican government. According to 2010 estimates, the literacy rate of Mozambique was 56.1% (70.8% male and 42.8% female). By 2015, this had increased to 58.8% (73.3% male and 45.4% female). Mozambique was ruled by Portugal, and they share a main language (Portuguese) and main religion (Roman Catholicism). 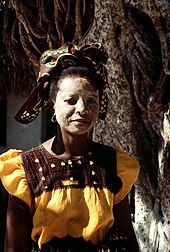 But since most of the people of Mozambique are Bantus, most of the culture is native; for Bantus living in urban areas, there is some Portuguese influence. Mozambican culture also influences the Portuguese culture. The Makonde are known for their wood carving and elaborate masks, that are commonly used in traditional dances. There are two different kinds of wood carvings: shetani, (evil spirits), which are mostly carved in heavy ebony, tall, and elegantly curved with symbols and nonrepresentational faces; and ujamaa, which are totem-type carvings which illustrate lifelike faces of people and various figures. These sculptures are usually referred to as "family trees", because they tell stories of many generations. During the last years of the colonial period, Mozambican art reflected the oppression by the colonial power, and became symbol of the resistance. After independence in 1975, the modern art came into a new phase. The two best known and most influential contemporary Mozambican artists are the painter Malangatana Ngwenya and the sculptor Alberto Chissano. A lot of the post-independence art during the 1980s and 1990s reflect the political struggle, civil war, suffering, starvation, and struggle. Dances are usually intricate, highly developed traditions throughout Mozambique. There are many different kinds of dances from tribe to tribe which are usually ritualistic in nature. The Chopi, for instance, act out battles dressed in animal skins. The men of Makua dress in colourful outfits and masks while dancing on stilts around the village for hours. Groups of women in the northern part of the country perform a traditional dance called tufo, to celebrate Islamic holidays. With a nearly 500-year presence in the country, the Portuguese have greatly influenced Mozambique's cuisine. Staples and crops such as cassava (a starchy root of Brazilian origin) and cashew nuts (also of Brazilian origin, though Mozambique was once the largest producer of these nuts), and pãozinho (pronounced [pɐ̃wˈzĩɲu], Portuguese-style French buns), were brought in by the Portuguese. The use of spices and seasonings such as bay leaves, chili peppers, fresh coriander, garlic, onions, paprika, red sweet peppers, and wine were introduced by the Portuguese, as were maize, millet, potatoes, rice, sorghum, and sugarcane. espetada (kebab), the popular inteiro com piripiri (whole chicken in piri-piri sauce), prego (steak roll), pudim (pudding), and rissóis (battered shrimp) are all Portuguese dishes commonly eaten in present-day Mozambique. Mozambican media is heavily influenced by the government. Radio programmes are the most influential form of media in the country due to their ease of access. State-owned radio stations are more popular than privately owned media. This is exemplified by the government radio station, Rádio Moçambique, the most popular station in the country. It was established shortly after Mozambique's independence. The TV stations watched by Mozambicans are STV, TIM, and TVM Televisão Moçambique. Through cable and satellite, viewers can access tens of other African, Asian, Brazilian, and European channels. The music of Mozambique serves many purposes, ranging from religious expression to traditional ceremonies. Musical instruments are usually handmade. Some of the instruments used in Mozambican musical expression include drums made of wood and animal skin; the lupembe, a woodwind instrument made from animal horns or wood; and the marimba, which is a kind of xylophone native to Mozambique and other parts of Africa. The marimba is a popular instrument with the Chopi of the south central coast, who are famous for their musical skill and dance. Some[who?] would say that Mozambique's music is similar to reggae and West Indian calypso. Other music types are popular in Mozambique like marrabenta, kwaito, afrobeat and other Lusophone music forms like fado, bossa nova, kizomba and semba. Football (Portuguese: futebol) is the most popular sport in Mozambique. The national team is the Mozambique national football team. Roller hockey is also popular and the best results for the national team was when they came fourth at the 2011 FIRS Roller Hockey World Cup. ^ Neto, Octávio Amorim; Lobo, Marina Costa (2010). "Between Constitutional Diffusion and Local Politics: Semi-Presidentialism in Portuguese-Speaking Countries". Social Science Research Network. SSRN 1644026. ^ Shugart, Matthew Søberg (September 2005). "Semi-Presidential Systems: Dual Executive and Mixed Authority Patterns" (PDF). Graduate School of International Relations and Pacific Studies. United States: University of California, San Diego. Archived from the original (PDF) on 19 August 2008. Retrieved 20 August 2016. ^ Shugart, Matthew Søberg (December 2005). "Semi-Presidential Systems: Dual Executive And Mixed Authority Patterns" (PDF). Palgrave Macmillan. 3 (3): 323–351. doi:10.1057/palgrave.fp.8200087. Archived from the original (PDF) on 4 March 2016. Of the contemporary cases, only four provide the assembly majority an unrestricted right to vote no confidence, and of these, only two allow the president unrestricted authority to appoint the prime minister. These two, Mozambique and Namibia, as well as the Weimar Republic, thus resemble most closely the structure of authority depicted in the right panel of Figure 3, whereby the dual accountability of the cabinet to both the president and the assembly is maximized. ^ "Moçambique tem novo governo". VOA. 17 January 2015. ^ a b c d "Mozambique". International Monetary Fund. ^ a b Schenoni, Natália Bueno. "Provincial Autonomy: The Territorial Dimension of Peace in Mozambique". academia.edu. ^ a b c "Mozambique". The World Factbook. Retrieved 22 May 2007. ^ a b c d e f g h i j k l m n o p q r s t u v w x y z aa "Mozambique (07/02)". U.S. Bilateral Relations Fact Sheets/Background Notes. U.S. Department of State. Retrieved 1 July 2018. This article incorporates text from this source, which is in the public domain. ^ Sinclair, Paul; Ekblom, Anneli; Wood, Marilee (2012). "Trade and Society on the Southeast African Coast in the Later First Millennium AD: the Case of Chibuene". Antiquity. 86. ^ Newitt, Malyn. "Mozambique Island: The Rise and Decline of an East African Coastal City" 2004. ^ "CD do Diário de Notícias – Parte 08". Retrieved 2 May 2010 – via YouTube. ^ Dismantling the Portuguese Empire, Time (Monday, 7 July 1975). ^ Pfeiffer, J (2003). "International NGOs and primary health care in Mozambique: The need for a new model of collaboration". Social Science & Medicine. 56 (4): 725–38. doi:10.1016/s0277-9536(02)00068-0. PMID 12560007. ^ "Special Investigation into the death of President Samora Machel". Truth and Reconciliation Commission Report, vol.2, chapter 6a. Archived from the original on 13 April 2006. Retrieved 18 June 2006. ^ "Mozambican refugees stuck between somewhere and nowhere". Al Jazeera. 22 July 2016. Retrieved 23 July 2016. ^ "Mozambique's Invisible Civil War". foreign policy. 22 July 2016. Retrieved 6 May 2016. ^ (4 April 2013) Mozambican ex-rebels Renamo in police clash BBC News Africa. Retrieved 5 April 2013. ^ Mozambique. State.gov (13 June 2012). Retrieved 29 January 2013. ^ sahoboss (30 March 2011). "Frontline States". South African History Online. Retrieved 11 March 2019. ^ Decreto-lei nº 6/75 de 18 de Janeiro. ^ Lei nº 4/86 de 25 de Julho. ^ Hanlon, Joseph (19 September 2007). Is Poverty Decreasing in Mozambique?. Open University, England. ^ "Mozambique | Þróunarsamvinnustofnun Íslands" (in Icelandic). Iceida.is. 1 June 1999. Archived from the original on 4 November 2013. Retrieved 2 May 2010. ^ "Mozambique proposes new anti-corruption laws". Google News. Agence France-Presse. 27 July 2011. Archived from the original on 23 February 2014. ^ "CORRUPTION ASSESSMENT: MOZAMBIQU" (PDF). USAID. 16 December 2005. Archived from the original (PDF) on 3 March 2016. ^ "Mozambique: Corruption Alleged in Anti-Drugs Office". All Africa. 27 March 2012. ^ "Mozambique Corruption Profile". Business Anti-Corruption Profile. Retrieved 14 July 2015. ^ "Great Lakes Africa Energy | Our Projects". www.glaenergy.com. Retrieved 2019-04-16. ^ kig, Antony; a (2017-02-02). "GLA Energy to construct 250MW gas powered plant in Mozambique". Construction Review Online. Retrieved 2019-04-16. ^ "Will Mozambique end up like Nigeria or Norway?". 2013-04-04. Retrieved 2019-04-16. ^ "The World Factbook – Central Intelligence Agency". cia.gov. ^ "Mozambique: Australian Company Plans New Coal Mine in Tete By 2010". Allafrica.com. Retrieved 24 December 2014. ^ "Railway Gazette: Pointers September 2010". Retrieved 10 September 2010. ^ "Golden Rock workshop exports locos to Mozambique". Business Line. Archived from the original on 6 December 2010. Retrieved 24 December 2014. ^ Singhvi, L. M. (2000). "Other Countries of Africa". Report of the High Level Committee on the Indian Diaspora (PDF). New Delhi: Ministry of External Affairs. p. 94. Archived from the original (PDF) on 8 April 2014. ^ Jian, Hong (2007). "莫桑比克华侨的历史与现状 (The History and Status Quo of Overseas Chinese in Mozambique)". West Asia and Africa. Chinese Academy of Social Sciences (5). ISSN 1002-7122. Archived from the original on 2012-05-22. ^ Horta, Loro (13 August 2007). "China, Mozambique: old friends, new business". International Relations and Security Network Update. Retrieved 3 November 2007. ^ a b c Relatório do I Seminário sobre a Padronização da Ortografia de Línguas Moçambicanas. NELIMO, Universidade Eduardo Mondlane, 1989. ^ Harries, Rev. Lyndon (1950), A Grammar of Mwera. Witwatersrand University Press, Johannesburg. ^ Barnes, Herbert (1902), Nyanja – English Vocabulary (mostly of Likoma Island). Society for Promoting Christian Knowledge, London. ^ ChiChewa Intensive Course, (Chewa is similar to Nyanja) Lilongwe, Malawi, 1969. ^ Doke, Clement, A Comparative Study in Shona Phonetics. University of Witwatersrand Press. 1931. ^ "Moçambique: Inquérito de Indicadores de Imunização, Malária e HIV/SIDA em Moçambique (IMASIDA), 2015" (PDF) (in Portuguese). Ministério da Saúde & Instituto Nacional de Estatística. p. 40. Retrieved 20 April 2018. ^ "UMC in Mozambique". moumethodist.org. July 2011. Archived from the original on 2015-05-10. 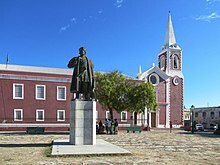 ^ LDS Statistics and Church Facts for Mozambique. Mormonnewsroom.org. Retrieved 21 June 2015. ^ JosephFebruary 1, Anne; Images, 2018Getty. "In Mozambique, A Jewish Community Thrives". The Forward. Retrieved 19 March 2019. ^ "Human Development Report 2009 – Mozambique". Hdrstats.undp.org. Archived from the original on 30 January 2010. Retrieved 2 May 2010. ^ "The State of the World's Midwifery". United Nations Population Fund. ^ Fitzpatrick, Mary (2007). Mozambique. Lonely Planet. p. 33. ISBN 1-74059-188-7. ^ a b c d e Salgado, Susana (2014). The Internet and Democracy Building in Lusophone African Countries. Ashgate. p. 79. ^ a b Matsimbe, Zefanias (2009). "Ch. 9: Mozambique". In Denis Kadima and Susan Booysen. Compendium of Elections in Southern Africa 1989–2009: 20 Years of Multiparty Democracy. EISA, Johannesburg. pp. 319–321. Archived from the original on 2014-02-28. ^ Mário, Tomás Vieira; UNESCO (2011). Assessment of Media Development in Mozambique: Based on UNESCO's Media Development Indicators. UNESCO. p. 123. ^ Berg, Jerome S. Broadcasting on the Short Waves, 1945 to Today. McFarland. p. 221. ISBN 978-0786469024. Morier-Genoud, Eric, "Mozambique since 1989: Shaping democracy after Socialism" in A.R.Mustapha & L.Whitfield (eds), Turning Points in African Democracy, Oxford: James Currey, 2008, pp. 153–166. "Mozambique". The World Factbook. Central Intelligence Agency.